Honestly, you get no Memeboxes for ages and then they all come along at once. I had four arrive today. I got this in a previous box and it makes for a great conditioner, leaving hair really smooth. Happy to see it again. This face mask uses mud from the Dead Sea, a place I’ve always wanted to visit. So I’ll start by smearing it on my face. Fun times. An anti-stretch mark cream. Now those I can provide, thank you babies. More of the above. Are they trying to say something about my stretch marks? An eye-scorching neon orange, in a pretty bottle with a flower on it. I can see the teenage daughter inheriting this. For removing of the moustache. Between that and the lack of strech marks, no one will recognise me. 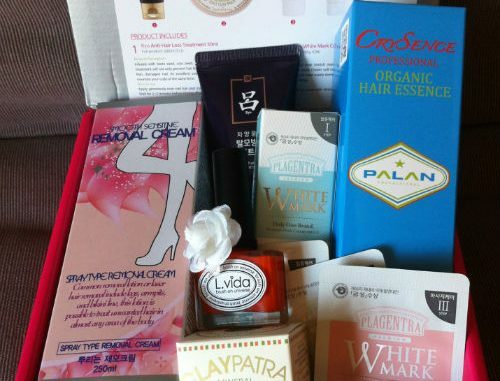 This fancy hair essence is the big ticket item in the box. I would never pay over £40 for hair goop so I’m fascinated to see if this does anything amazing and magical. It should make you a cup of tea too, at that price. This box retails at $23 plus $7 shipping. I paid slightly less as I had some credit in my account, so it worked out at $24.99/£14.50 all in. Box value is $133.22 / £78, so not too shabby at all. 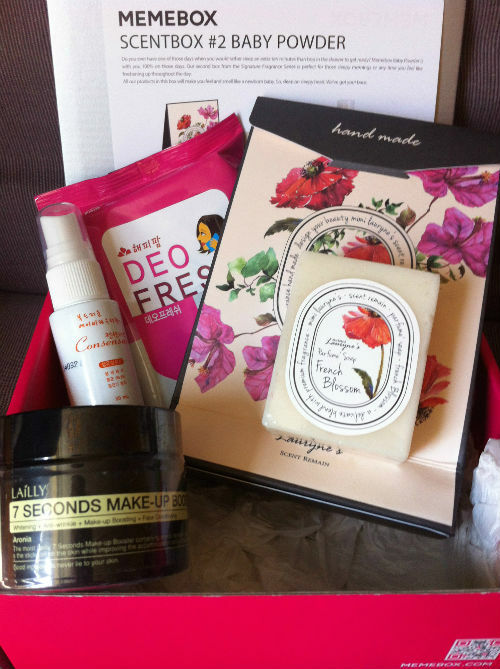 Next, there’s the Memebox scent bundle. These were on sale as individual boxes, but there was a 3 for the price of 2 offer, so since I already wanted the Rose and Grapefruit scented boxes I figure that I might as well get the Baby Powder box as well, for free. These boxes were on sale at $15 each plus shipping at $6.99, or all three for $30 plus shipping, with 3-4 items promised in each. I had a few discounts to use up, so I paid $28.99/£17 for all three including shipping. Considering the value of the boxes is over $150/£90 I think I did pretty well there. But box value is meaningless if you’re not going to use what’s inside. Luckily, these boxes score pretty well on that front too. This is a lip and cheek tint, a bit like Benefit’s Benetint, but more jam-like. Looks like blood but applies like rose. 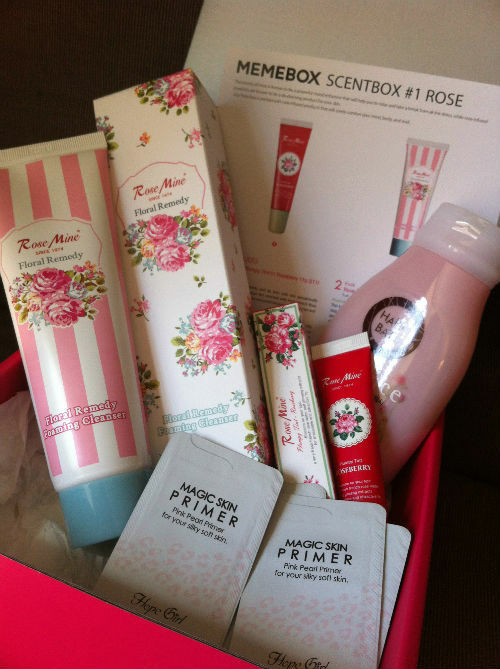 Although the samples are small, I like that there are plenty to try and I like the idea of a rose-tinted primer. A lovely soft and crumbly luxury organic soap containing shea butter, olive oil and coconut milk. Delicious. For when your clothes don’t smell enough like nappies. This I am less excited about. This seems to be a primer, except it’s blue and smells faintly of baby powder. May come in handy for Smurf cosplay. I like it though. Useful for travelling or when you are feeling skanky. This is a citrus mist for unstinkyfying your habitat. A posh air freshener, basically. Really like this. The ultimate multi-functioning product. It’s a hydrating gel that’s a toner, an emulsion, an essence, a cream, a soother of burns and a sleeping pack. It’s also anti-aging. Won’t make you a cup of tea though. They always leave that part out. This moisturising lip mask is probably best not worn in public, or when answering the phone. Looking forward to trying it out. More refresher type wipes, for when you just can’t smell fruit bowly enough. I paid for this box with my own money.